Jason & Cheryl Isenberg went through one hell of an ordeal when they first took up cosplay. 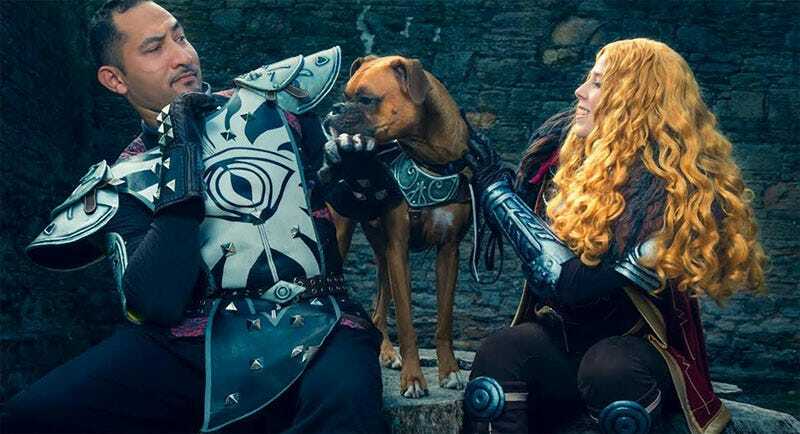 Now that things are on the mend, they’ve decided to expand their crew: meet Fable, their three year-old Boxer who, having been “helping” with their cosplay for years, is now allowed in on the fun. This Dragon Age shoot features Jason as Cassandra, Cheryl as Cullen and Fable as Barkspawn. Photos by Gapple. You can see more of Jason & Cheryl’s work at their Facebook page.